Bright Ideas from Rittal | Rittal - The System. 2019-01-03. If your data centre is in need of better illumination, then Rittal can help. The company will be offering enlightenment at its Stand D610 at Data Centre World, London, from 12-13 March 2019. The company will be offering enlightenment at its Stand D610 at Data Centre World, London, from 12-13 March 2019. 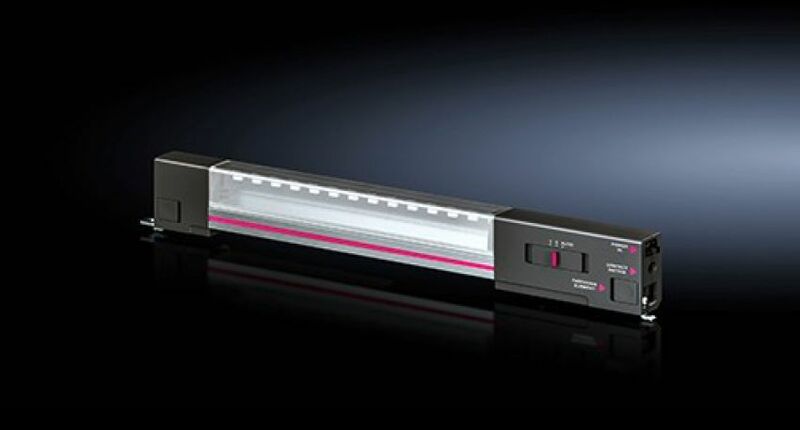 Designed for both IT network and server enclosures, Rittal’s LED light has an output of 600 lumens, meeting the standard requirement for racks such as the Rittal TS IT. It has a transparent plastic cover with integrated Fresnel lenses. The lenses deliver optimal illumination for users, ensuring that their racks are fully lit from top to bottom and precisely where needed. It is easily to fit, either mounted vertically or horizontally, with a magnetic attachment which speeds up installation. In addition, there are just two different “Plug & Play” connection cables. The EU version has a flat-pin connector making it suitable for all European countries (except the UK). An additional universal cable that comes with an IEC C18 connector is designed for International data centres, and is compatible with all standard PDUs (power distribution units). The light’s IEC C18 connection cable comes with UL approval and supports a wide range of voltage (100 – 240 V AC, 50/60 Hz) for worldwide usage, reducing storage costs and making product selection far easier. Rittal’s portfolio of product and service solutions will be on show at Data Centre World (Excel, London, 12-13 March 2019) on Stand D610.